Personal finance bloggers are in love with the topic of net worth these days. It’s their main measure to see how well you’re doing financially, but is it really the right measure? Is there something else better out there? I certainly think so… Ask me, and I’ll tell you to focus on your future value. While this isn’t necessarily bad advice (I give it all the time), I think it’s time to broaden your horizons a bit and learn something even more meaningful. It’s time to branch out beyond the simple net worth calculation and bring on a whole new formula that will not only let you gauge how well you’re doing in the present, but how wealthy you’ll become in the future! It’s time to focus on your future value. Before we get too far ahead of ourselves, let’s take a step back and make sure we know what we’re talking about. For starters, what does the term “net worth” really mean? Net worth is simply what you own minus what you owe. Said a more sophisticated way…your assets minus your liabilities. If you’re a young college grad renting an apartment and the only asset you have to your name is your car, you’d simply take the value of the car and subtract how much you owe on it. Let’s say according to Kelley Blue Book, the private sale value is $6,000 and you owe $2,000. Your net worth is $4,000. 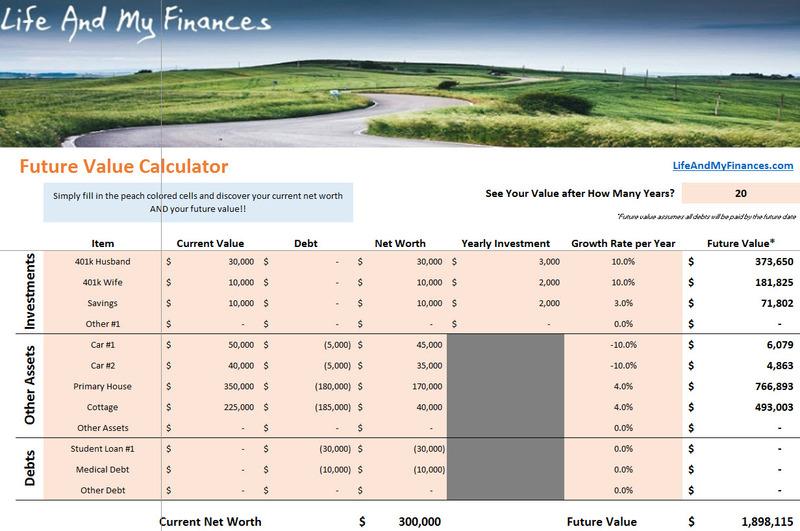 Simply apply the same formula to each asset and add up the individual net worth values. The bottom-line result is your overall net worth. But you know what…who really cares? Net worth is a great measure for how much you’re worth at this very moment, but it does very little in the way of predicting your future worth. Let me illustrate with a cute little story (that you’ll hopefully remember for life). Jim and Tom work in the same office. They’re both accountants, are the same age, and you know what? They even have the same net worth: $300,000. Everything about them seems the same, but in reality, their futures are on totally different paths. With an equivalent net worth, they’re basically in the same place financially, right? Spoiler alert: their end result is millions of dollars apart. Let’s pause on the story for a minute so I can give you a true visual of what future value actually means. It’s so important, I don’t want you to miss it. While net worth is a calculation of where your financials are at currently, your future value is a measure of where you’ll end up if you keep spending your money like you do today. And, as you’ll see in just a minute, these two measures are VERY different. If you would ask me which one you should pay attention to, I’d tell you to focus on your future value every. single. time. How is Future Value Calculated? It’s not that easy to calculate – heck, some so-called “experts” even get stumped with the calculation from time to time. And it’s a little difficult to explain to someone that’s just looking for an easy read on a solid personal finance blog. But thankfully, all of you are smarter than the average reader. And, on top of that, I’m getting pretty decent at explaining things so that aren’t so easy to understand. All combined, I think we’ll get through this, and you’ll be FAR better off at the end of this article than you were in the beginning. And that’s the whole reason you seek out these personal finance articles in the first place, right? BOOM, that’s it! With this information, you can figure out the future value of your investment. Like I said…the formula can be a little daunting. Thankfully, I built a tool so you can simply input your numbers and get a result without the professional mathematician exam above! Download the free future value tool here. some debt that he just didn’t get around to clearing up yet. In 20 years, Jim’s $300,000 net worth will become $1.9 million. Pretty solid huh? Before we jump up and down for Jim, let’s take a look at Tom’s numbers. In 20 years, Tom’s future value is projected to be…not $1.9M like Jim…but over $5 million!! How is it that Jim and Tom could be worth the same amount of money today, but have such a discrepancy just 20 years later? Your future value has little to do with your exact net worth, but it has everything to do with where you’re investing your money. his lack of debt payments left him with plenty of funds to invest more heavily! How is Your Future Value Looking? You may have thought you were sitting pretty because of your net worth, but your reality might not be as rosy as you once thought. It’s time to find out for sure. 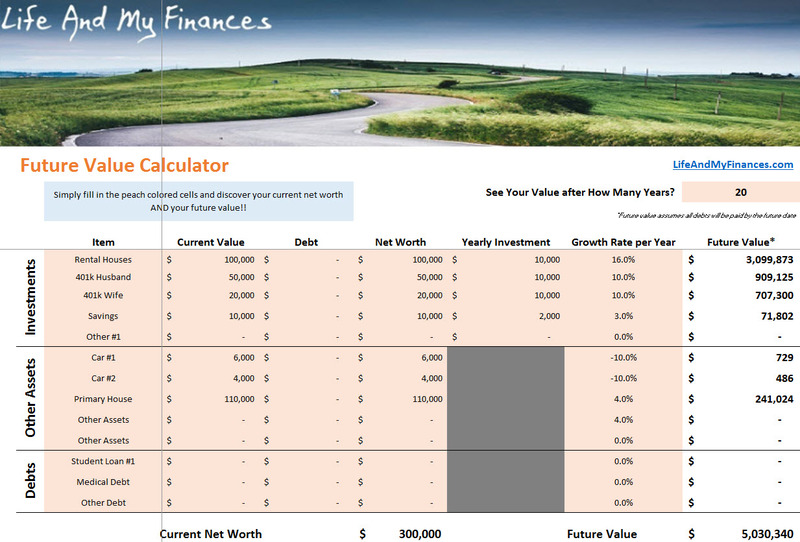 Download the “Focus on Your Future Value” Excel sheet here. What is a Good Future Value? If you’re retiring in the next few years, a little over a million bucks is a good target. If, however, you’re not retiring for another 20+ years, your target should really be $2-$3 million (thanks to a little evil green figure called inflation…). Anything below these targets, and you might want to focus on your future value a bit harder than you are today. Related: Retirement Savings by Age…Are You on Track? So here’s the big question….how are you doing with YOUR future value?? Download the tool and respond to the poll below!! What is YOUR Future Value?? The post Forget About Your Net Worth…Focus on Your Future Value appeared first on Life And My Finances.